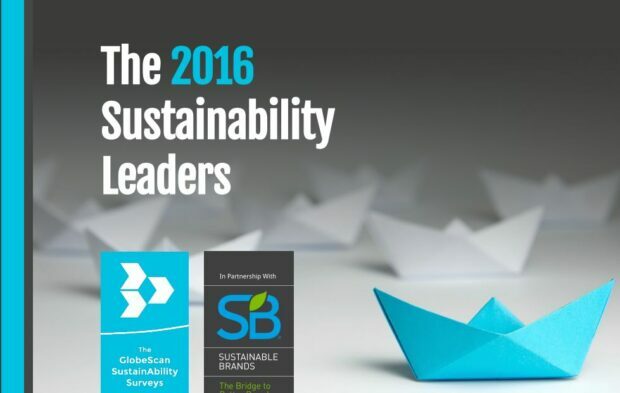 SustainAbility and GlobeScan’s published the new editon of the annual Sustainability Leaders Survey. For the research 900 expert stakeholders have been asked representing business, government, NGOs and academia across 84 countries to evaluate the progress that institutions have made since the 1992 Earth Summit and reflect on their expectations for the next 20 years. The also analyzed expert views on which companies are considered to be leading on integrating sustainability into their business model as well as which NGOs and national governments are making the biggest contribution to advance the sustainable development agenda. In addition, we asked expert opinion on the best pathways for business to act on the Sustainable Development Goals (SDGs). 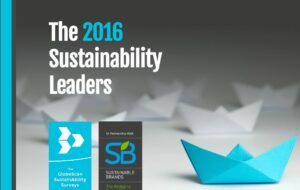 The 2016 Sustainability Leaders Survey was conducted and produced in partnership with Sustainable Brands. Sustainability experts appoint Unilever as leader for the sixth consecutive year. Compared to 2015, Patagonia and IKEA have received more endorsements this year, leading to a more even distribution of expert votes among the top-rated companies in the second-tier. Tesla, which is the only new entrant within the list of top 13, has also seen a significant boost in its reputation. Over 900 experts in 84 countries were asked, unprompted, to name three companies that they believe are leaders in integrating sustainability into their business strategy. Four in ten experts (43%, up five points from 2015) mentioned Unilever as a global leader on sustainability, a position that the company has maintained for the sixth year in a row (no other company has maintained top recognition for so long in the 19-year history of the survey). 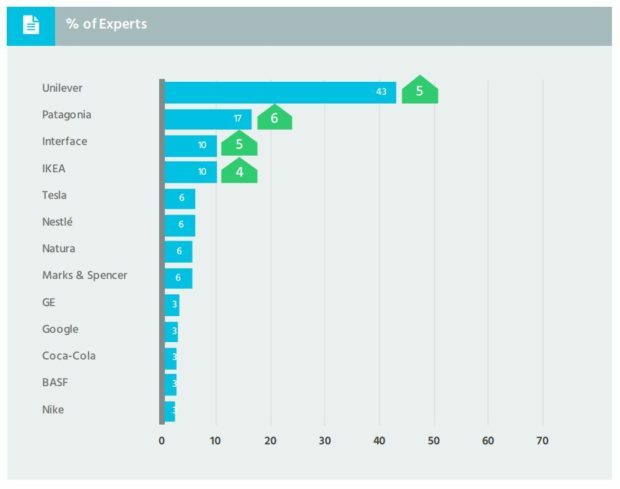 Compared to 2015, Patagonia (in second position at 17%, up six points), Interface (tied for third with 10% of mentions, up 2 points) and IKEA (tied for third position at 10% with an increase of 5 points) have received more endorsements this year, leading to a more even distribution of expert votes among the top-rated companies in the second tier. Tesla, which is the only new entrant within the list of the top 13, has also seen a boost in its reputation for sustainability and is tied for fifth position along with Nestlé, Natura and Marks & Spencer (all at 6% respectively). Non-state actors continue the trend of significantly outperforming all other organizations on their sustainable development (SD) leadership record. The contribution of NGOs since the 1992 Earth Summit in Rio is viewed positively by 57% of polled experts. Social entrepreneurs, academic institutions and citizen-led mass social change movements are also evaluated positively by respondents. Meanwhile, national governments rank at the bottom of the list, rated positively by only 6% of respondents. Sustainability experts believe that national governments and the private sector equally share the responsibility for advancing SD over the next two decades, with 34% of experts rating each as vital to progress. Multi-sectoral partnerships are also seen as playing a critical role. Expectations for governments to lead have gradually decreased in recent years, while those for the private sector have been rising. Unilever continues to be regarded as the global corporate leader on sustainability. It has further increased its leadership margin and was named as a leader by 43% of polled experts. 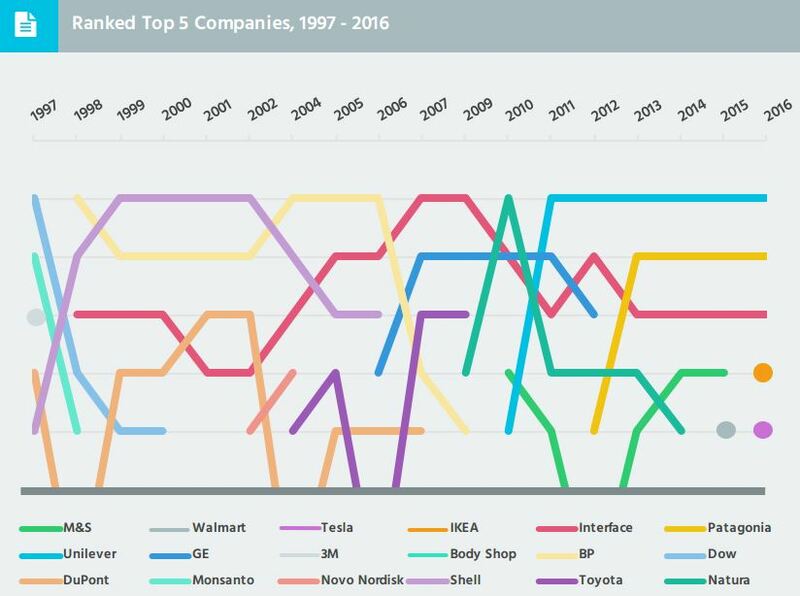 Patagonia, Interface, IKEA and Tesla are also among the top-rated leaders. Regional leadership ratings are dominated by consumer-facing companies, with Unilever leading in Europe, Patagonia in North America, Woolworths in Africa and Natura in Latin America. In Asia, the Tata group of companies occupies the top position on the list. Aligning sustainability strategy with internal culture and values and integrating purpose via a common brand promise are perceived as two key drivers of corporate leadership. In the case of Unilever, vocal support of sustainability by senior leadership is the single most important factor accounting for its outsized reputation. 44% of respondents suggest that the most effective way for companies to make a positive contribution towards the Sustainable Development Goals (SDGs) is through pursuing partnerships and developing products and services. Experts also recommend that the private sector should apply the SDGs as a lens in goal-setting and risk analysis processes. WWF and Greenpeace continue to be seen as NGO leaders on sustainable development, with 30% and 20% of expert votes respectively. Meanwhile, Sweden (27%) and Germany (25%) are most frequently named as government leaders. Experts are critical of industry efforts to transition to sustainable development, with the record of all sectors viewed primarily negatively. The forest products sector, biotechnology and ICT companies are considered to be managing the transition the best, while the oil & gas and mining industries are viewed negatively by more than 75% of experts. Hey Buddy!, I found this information for you: "Sustainability experts appoint Unilever as leader for the sixth consecutive year". Here is the website link: https://www.duurzaam-ondernemen.nl/sustainability-experts-appoint-unilever-as-leader-for-the-sixth-consecutive-year/. Thank you.